On this self-guided holiday walk the Rota Vicentina, a well-marked trail along cliff tops, amongst dunes and beside dramatic rocky shorelines to Cabo Sao Vicente, the south-western most point of Portugal and continental Europe. Your accommodation for the first two nights of your holiday is in the coastal village of Zambujeira do Mar. After checking-in, you may choose to spend some time exploring this charming village, set against a backdrop of wild beaches and rugged cliffs. There are several small cafes serving delicious, fresh custard tarts and coffee which you can enjoy. The cafes at the bottom of the village have wonderful views out to sea and great vantage points for sunset. This evening, we recommend enjoying a dinner of freshly-caught fish in one of the family-run restaurants in the village. On some days of your trip the walks are affected by tide times. Please check these in advance and plan your walks accordingly. This morning starts with a short taxi transfer to the village of Cavaleiro. From here, your walk takes you along a coastal section of the famous 'Rota Vicentina' footpath. Shortly after leaving Cavaleiro you reach the cliff path and the lighthouse at Cape Sardao, from here on there are fantastic coastal views for most of the day. The route follows a wide path for most of the time but there are narrower sections and one short, steep descent towards the end of the walk. You can expect today's 12 kilometre walk to take approximately five hours. If you would like a longer walk today there is the option of starting in the village of Almograve. This section begins with a wide gravel path parallel to the coast and then turns into gentle sandy dunes. For the most part you stick on the coast but a short section which winds in to a pine forest offers a beautiful complement to the coastal scenery. Starting in Almograve, the total distance walked today is 21 kilometres and will take approximately 7 hours. Today's walk follows another section of the Rota Vicentina along the stunning Atlantic coast. This route alternates between rolling dunes and rocky cliff paths where storks nest, the views along the way are beautiful and there is no shortage of spots to stop for a snack and to take it all in. Following the coast, you pass pristine golden beaches and the fishing village of Azenha do Mar before reaching the mouth of the River Odeceixe. Here you turn inland and follow the river to reach the attractive, laidback village of Odeceixe, where you will spend the night. You can expect today's 20 kilometre walk to take approximately six hours. There are two steep sections on today's walk, both are very short and covered in just a few minutes but walking poles would be useful (but not essential) for these sections. Once again, today's route follows the Rota Vicentina, although this time you walk inland. After passing alongside an irrigation channel winding through farmed fields, the scenery opens out into a landscape of heather and fragrant shrubs. If you'd prefer to remain on the coast, at low tide an alternative route crosses ravines, from one beach to the next. Whichever route you choose, you will arrive to the interesting village of Aljezar. This is where we stay tonight so there is time to explore the 'old village' and the Moorish castle. You can expect today's 18 or 17.5 kilometre walks to take approximately seven and four-and-a-half hours, respectively. Today, your choice of walk will once again depend on the tide. After a short taxi ride to the fishing village of Arrifana, if tides are low, you can walk along rocky strands and sandy beaches. If water levels are high, an alternate route takes you inland via Bordeira to Carrapateira, where you will find your hotel for the night. You can expect today's 12 kilometre walk to take approximately four hours. Today you have a choice of circular routes from Carrapateira. The shorter leads you through sand dunes to reach the picturesque beach at Carrapateira. The longer walk begins with a section along the coast then turns inland through idyllic valleys, passing hidden villages like Pedralva, where you may wish to stop for lunch. Alternatively you can do yesterday's coastal walk if conditions didn't allow for that. You can expect today's 24 kilometre walks to take approximately seven hours. Setting off from your hotel, today's route incorporates inland and coastal sections, depending on the tides. Along your way, you're likely to spot fishermen perched high on the cliffs. Your route ends in historic Vila do Bispo, where you will spend the next two nights in a hospitable hotel, complete with indoor swimming pool and sauna. You can expect today's 19 kilometre walk to take approximately seven hours. Your last day of hiking takes you through pastures and fields to the far southwest corner of Portugal, walking along flat tracks and narrow fishermen's paths above rocky shores. If the weather is warm, you have the option of stopping for a swim at 'Praia do Ponto Ruiva'. Your walk ends at windy Cape Sao Vicente, with sweeping views of the ocean. From here, you can either walk back to your hotel, or catch a public bus or taxi, before enjoying your final evening in Vila do Bispo. You can expect today's 14 kilometre walk to take approximately four-and-a-half hours. A walk back from Cape Sao Vicente will add an extra six kilometres and an hour-and-half to your route. Overall, spring, early summer and autumn are ideal times for a trip to Portugal - though the weather varies enormously from region to region. The northern high plains has both extremes, stiflingly hot in summer, bitterly cold and swept by freezing winds in winter. The Atlantic coast, in contrast, has a tendency to damp and mist, and a relatively brief, humid summer. The Mediterranean south is warm virtually all year round. The islands have very different weather patterns due to their positioning and can have sudden rain falls throughout the year so waterproofs are recommended even in the summer. Light rainwear may be needed at any time of year, and a warm fleece/jacket is recommended for cooler evenings and nights early and late in the season. Well worn, sturdy walking boots with good ankle support are essential for the walks. Sandals and trainers are recommended for relaxing in the evenings. A water bottle, sunhat and sunscreen are all essential and you may wish to bring a light torch. Walking poles recommended. £2.00 - 3.00 depending on your location, well touristed areas are usually slightly more expensive. Take the majority of your spending money in Euros cash. Cash-point machines are available in all major towns. Bankcards with the Cirrus logo are accepted. Travellers cheques can be exchanged in all major towns but are not recommended due to the high rate of commission. We'd recommend flying into and out of Faro or Lisbon. Faro is served by budget (including Easyjet and Ryanair), charter (including Thomson Airlines and Monarch) and scheduled airlines (including British Airways and TAP - non-direct) from many UK airports. Lisbon is served by fewer airlines from fewer UK airports, but these included Easyjet, Ryanair and British Airways and TAP. At the start of your trip you can fly into Lisbon or Faro airports. In low season there is one daily direct bus at 17.00 (with an additional one at 10.30 on Fridays, Saturdays and Sundays). Alternatively there is a bus at 15.00 to Odemira (approx. 4 hours). From there a taxi to Zambujeira (20km) costs approx. 20 euros. If you miss the 17.00 bus, at 17.30hrs there is a bus to San Teotonio (duration 3.15hrs). You will then have to take a taxi to Zambujeira (15min). Take a taxi or bus from Faro airport to Faro bus station (Terminal Rodoviaria, EVA bus company). Alternatively if you have travelled by TAP there is a free shuttle bus. Departures Mon to Fri at 08.00 and 09.00 (except bank holidays) and daily at 12:30. Duration 1 hour and 45 min. For further details please see: http://www.eva-bus.com/. From Sao Teotonio, take a taxi to your accommodation in Zambujeira (15 min). From Vila do Bispo travel with EVA bus company to the bus station in Lagos. (The bus stop in Vila do Bispo is opposite Caixa Agricola bank. You buy your ticket to Lagos on the bus). Duration is 30 to 45 minutes. There is at least one bus every 1.5 hours. The first bus departs at 06:15 Monday - Saturday (07:15 Sundays and holidays). Check departure times at the cafe opposite the bus stop or at http://www.eva-bus.com/. 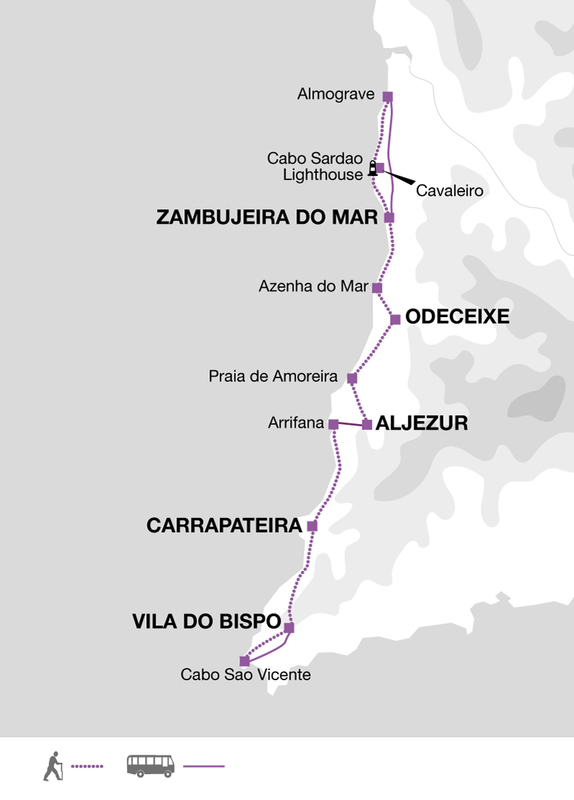 (Alternatively take a taxi from Vila do Bispo to Lagos). Travelling with Eva bus company from Lagos to the bus station in Lisbon, there are approx. 5 regular departures a day (the first at 05:45, last at 18:15 hrs). Duration is just under 4 hours. See http://www.eva-bus.com/ for complete timetables. From Lisbon bus station you take a shuttle bus or taxi to the airport. Travel to Lagos as above. 1. Lagos-Faro by bus with EVA (Terminal Rodoviaria). Duration 2 hours. Departures from 06:50 to 17:15 hrs, with services approximately every 2 hours. 2. Lagos-Faro by train. To get to the train station, from the Rodoviaria bus terminal cross the footbridge and walk right alongside the harbor building. There are trains every 2 hrs approx, from 06:15 to 19:15 hrs. Duration 2 hours. From Faro, you take a bus or taxi to the airport. 1. Airport shuttle: the bus stops opposite the Rodoviaria Terminal (take the 'Urbana' bus, direction 'Praia de Faro'). Duration approx 20min. Several departures daily during the week. Timetable is more irregular at the weekends. Ask the driver for assistance. 2. A taxi from Faro to the airport costs about 10 euros. There are taxi ranks in front of the bus station and by the park ('Jardim Manuel Bivar' near the History Museum). There are buses every 45min (approx) from 07.00 hrs to 20.00 hrs, with fewer services on Saturdays and Sundays. http://www.rede-expressos.pt/default.aspx (click on the English flag). Portugal: Visas are not required by UK, E.U nationals, Australian, New Zealand, US and Canadian citizens. Other nationalities should consult their local embassy or consular office. On this journey you walk for 5 to 7 hours on 7 days, mainly on unsurfaced tracks, coastal trails and footpaths. 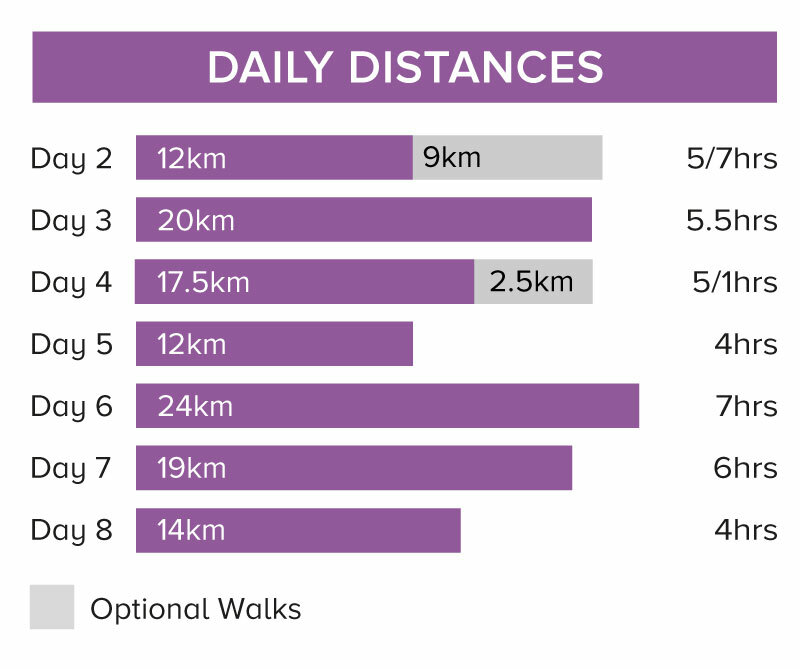 The distance covered is a minimum of 128 km (an average of 18 km per day). On two days there is a choice of route depending on the tide. Tue 26 Mar 2019 - Fri 31 May 2019 Your trip can depart anytime between the above dates. Contact us for triple room requests and solo traveller prices. Sat 1 Jun 2019 - Mon 24 Jun 2019 Your trip can depart anytime between the above dates. Contact us for triple room requests and solo traveller prices. Tue 25 Jun 2019 - Sat 27 Jul 2019 Your trip can depart anytime between the above dates. Contact us for triple room requests and solo traveller prices. Sun 28 Jul 2019 - Sat 31 Aug 2019 Your trip can depart anytime between the above dates. Contact us for triple room requests and solo traveller prices. Thu 26 Sep 2019 - Thu 31 Oct 2019 Your trip can depart anytime between the above dates. Contact us for triple room requests and solo traveller prices. Fri 1 Nov 2019 - Tue 31 Dec 2019 Your trip can depart anytime between the above dates. Contact us for triple room requests and solo traveller prices. Wed 1 Jan 2020 - Tue 31 Mar 2020 Your trip can depart anytime between the above dates. Contact us for triple room requests and solo traveller prices. Wed 1 Apr 2020 - Sun 31 May 2020 Your trip can depart anytime between the above dates. Contact us for triple room requests and solo traveller prices. Mon 1 Jun 2020 - Wed 24 Jun 2020 Your trip can depart anytime between the above dates. Contact us for triple room requests and solo traveller prices. Thu 25 Jun 2020 - Mon 27 Jul 2020 Your trip can depart anytime between the above dates. Contact us for triple room requests and solo traveller prices. Tue 28 Jul 2020 - Mon 31 Aug 2020 Your trip can depart anytime between the above dates. Contact us for triple room requests and solo traveller prices. Tue 1 Sep 2020 - Wed 30 Sep 2020 Your trip can depart anytime between the above dates. Contact us for triple room requests and solo traveller prices. Thu 1 Oct 2020 - Sat 31 Oct 2020 Your trip can depart anytime between the above dates. Contact us for triple room requests and solo traveller prices.